Nick joined Parkmead in November 2011 as a senior geologist and was a core member of the team that worked on the recent UKCS 27th Licensing Round, where Parkmead was successfully awarded 30 blocks covering eight new licences. He was previously at Dana Petroleum plc, working directly with Dr. Colin Percival on a wide variety of projects in the exploration and development stage of the asset life cycle. Nick holds a degree in Earth Science from Glasgow University. Joanne began her career in the oil and gas industry 6 years ago when she joined Dana Petroleum plc as a geophysicist. At Dana, Joanne worked on a wide range of exploration projects throughout the UK, wider Europe and Africa. She was a key member of the team that worked on the recent UKCS 27th Licensing Round where Parkmead was successfully awarded 30 new blocks covering eight licences. Joanne holds a first class degree in geology from Edinburgh University and a Ph.D. in geology and geochemistry from Liverpool University. 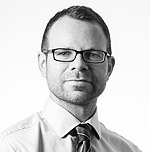 Kevin Holley is the Group’s financial controller. He has over 20 years of experience in a diverse range of business sectors and has extensive knowledge of public accounting practices in audit and taxation. Prior to joining Parkmead, Kevin held a senior finance position with an AIM listed oil services group. Kevin is a Chartered Certified Accountant.